We have two gently used high density shelving systems (also called used mobile shelving and used compact shelving) that have been well kept in an air-conditioned office environment. 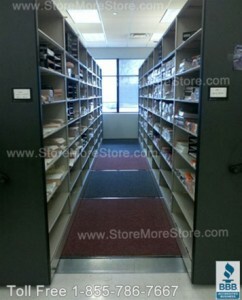 The shelving systems are in excellent shape and ready to save you valuable office or warehouse storage space. Both of the used Spacesaver high density storage systems are equipped with mechanical-assist three spoke control handles which can move multiple rows of shelving (thousands of pounds) with the touch of a finger on the control handle. These used mobile shelving systems can be reconfigured to fit into your floor space and the items you are storing. One of the used mobile storage shelving systems was originally designed for file folders and the other was used for supplies. Both of these systems can be easily adjusted or modified to store record boxes, part bins, or any materials requiring a 12”, 18”, 24”, 36”, or 48” shelf depth. 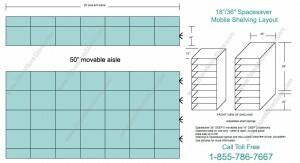 The used Spacesaver mobile shelving is very flexible to reconfigure. 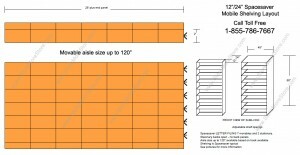 You can cut the shelving height down, shorten the length of shelving rows, or use the shelving in a fixed application. Heavy-duty steel shelves are easily adjustable on 1-1/2” centers. For more information, contact us toll free 1-855-786-7667. This used high density shelving was originally designed to store file folders, but this system could be easily adjusted or modified to store record boxes, part bins, or any materials requiring a 12”, 24”, or 48” shelf depth. These Used Compact Shelving Systems are Bargains and Will Go Quickly! This used high density shelving was originally designed to store supplies and would be perfect for any office or warehouse storage requiring 18” or 36” deep shelves. Call toll free today 1-855-786-7667, for pricing and more information on these Spacesaver used compact storage shelving systems (systems will be available for sale in August 2011). Looking for used storage equipment? 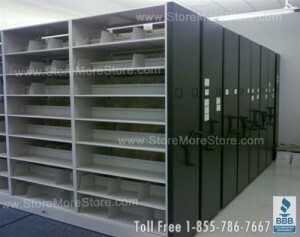 StoreMoreStore always has used high density shelving, used vertical carousels, and used storage racks available. Click here to view and bookmark our specials page!